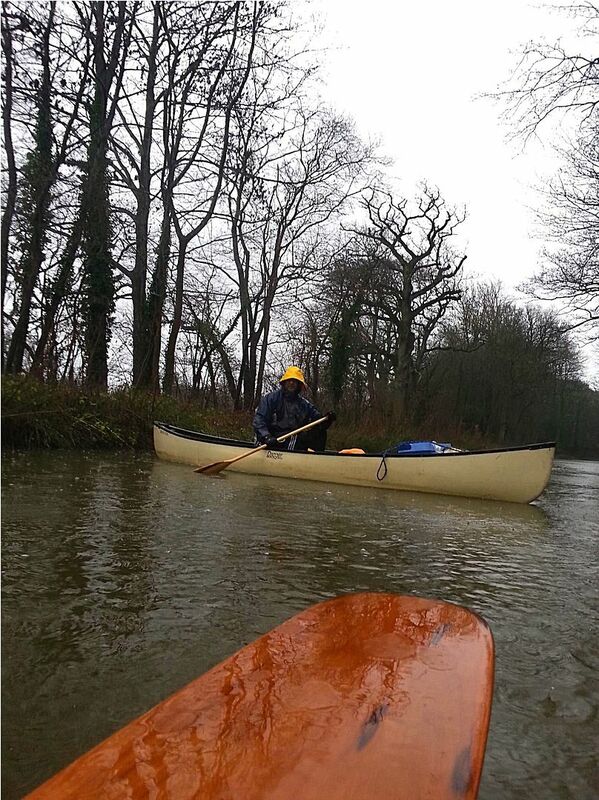 Who fancies a paddle on Sunday 3rd January 2016 on either the Thames, River Wey or Basingstoke canal. A social paced paddle open to all with perhaps somecooking, brewing, drinking and eating. Open to suggestions. Assuming I'm back from the Lakes, which I should be, I'll be there. Will update you a little nearer the time. Colin and I are possibles - depends on family stuff but will keep an eye on thread and confirm nearer the time. Depends hen I get back from Scotland, but will try and make it. I'll keep an eye on the thread and confirm nearer the day. Hope to make this one, Will confirm later. How wide our net is spread. If I'm back from Anglesey, which I might be, then I'm on for a thermos and sandwich stop trip. I might be able to amuse my self whilst the devils fire machines are at work with some canoe building, spoon whittling, novel reading, skateboarding, napping or even paddling. I, too, will confirm nearer the time. If I am back from my sofa, and walking,driving,lifting and loading, I will come along and bring my firey Aus billy,wood to burn,and assorted things to eat. Hoping to make this one as I've not been able to get out much this year. I too can confirm nearer the time. If you can just drive up Lynn,you are more tha welcome to my bow seat again? Cheers Freeway, I will see how it goes. It's tough work I know, but somebody has to do it...no matter how bad your dyslexia gets, KO? Last edited by Bonarmbj; 18th-December-2015 at 03:03 AM. So let me get this straight Bonarmbj, you are working the 2nd and you are.... completely free on the 3rd Sunday. Whats the problem? Yeah, that's how I read it! Well I could bring a bag or two of cereal up to the meet for you... or is it a pallet or 4? Mr Bonar's version of 'working late' is slightly different to many people's!! Oh, and i thought i had replied to this thread to say unfortunately i cant make it... but it seems not! More importantly can Mojo come? Ha ha - unfortunately, our friend's dog would not forgive us if we turn up at their house without him!! As mentioned earlier in the post, I'll be working late on the 2nd, as I was very much this evening. Which then in turn skews my plans very much for the next day....with much frustration and anger being a by-product of this situation! If I can make it, I will, and I would very much like to....even if I manage to get there 'just in time' for the take-out with a tripod, some fire hot chocolate & biscuits! Sounds good - if I can help on the delivery front just shout, but I'm guessing it's not just a few bags that you're collecting? I'm home early tonight..so I guess now that it must be Christmas! Whatever you guys decide to do for this trip, and of course then post the details here, I'll then try my best to make it to your chosen take-out & have some tea and toast on the go by the time that you get there. In the mean time though..
Merry Christmas, have a god 'un! I am easy Adrian0. I did think of doing Andy's loop on the Thames and doing some gardening on the way since i think there were some downed trees. I think you would enjoy the River Wey Palace loop - but there is a long portage which can be a pain. Windsor Castle loop on the Thames looks fab. A loop is preferable from my point of view, will ensure I bring my trolley! Hi Maj Its getting close now, is there any plan of action yet? It's time to take the bull by the horns and err,twist it cos he that laughs last gathers no moss and is worth two in a bush. Your idea Maj so it's your call.I just wish I could join you. How about meeting at the Tannery put in 10.30 for 11.00 am. We could do the half of the "Wey Rapids / Brooklands loop" via the golf club but will need some advance planning. I am not familiar with shuttles. What does everyone else think? I will go with the majority. I would be interested in joining you all. As Mal has indicated that there a number of obstacles on the Triggs loop and bearing in mind the rain that we are experiencing, might it be best to avoid this route? Happy to do Gresham Mill, not familiar with the others mentioned, but whatever you decide Maj. Sitting in Tesco at Bangor, having survived the most vicious storm I can remember from the security of our house on the Island, and having snow on the tops today, I just wish you would make up your mind !!!!!!!!! Meeting at the Tannery put in 10.30 for 11.00 am. Gresham Mill with a lunch stop at Woking Palace - followed by the Abbey Loop. Hope to be back at the cars by 4 pm. Sadly, I've been fighting off a virus for the last week or so and as I'm coughing like a good'n and the weather forecast looks a little wet for Sunday, I fear we may have to bow out if this. However, if ok with you, Maj, will keep an eye on things and if we decide last minute we can make it, I'll let u know. Last edited by KeithD; 1st-January-2016 at 04:39 AM. you poor thing. Healing vibes being sent your way. Is it advisable to cancel this paddle based on the current weather / river conditions. It looks like heavy rain / with 19 mph winds. Perhaps move to the Basingstoke Canal? That Winchfield car park looks like a damned fine place for a few glasses of Masala Chai & some warm Cinnamon toast....Especially so after a day out battling against the elephants! Packing my 'sticks and strings' as we speak...so to speak! I am happy with the winchfield hurst option, with the weather the way it is it might be better ? Did a quick reccy on the river today. 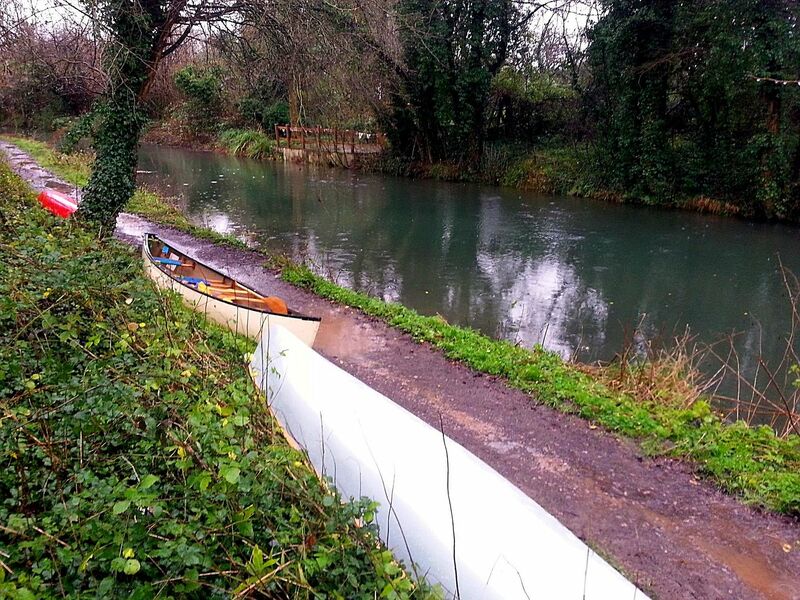 Because of the high winds - Basingstoke canal would be the better option. So shall we meet at the car park opposite the Barley Mow pub 10.30 for 11.00 am? Car Park is free - but there is a height restriction. I'm unlikely to join you, but sensible decision I think, the river will be rising too. 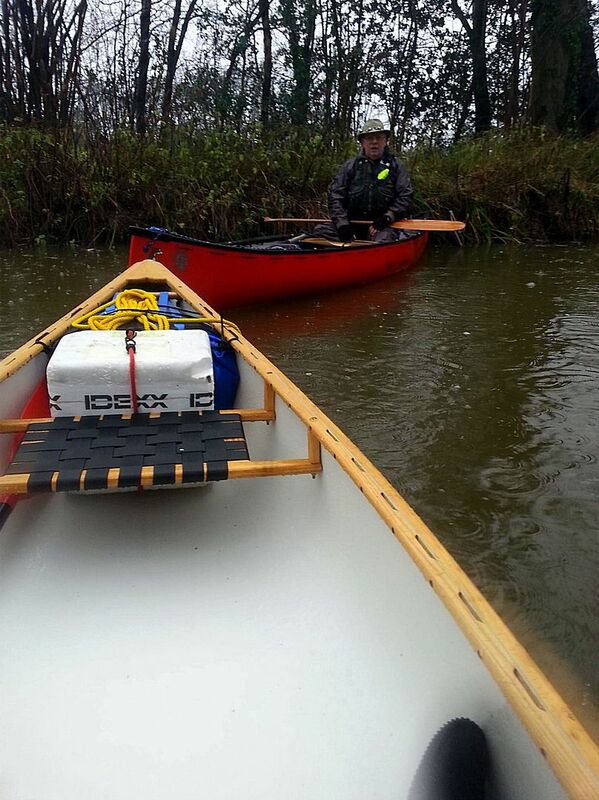 The majority of the paddle towards Odiham is sheltered, though between Colt Hill Wharf and the castle it can be windy. The put in on Paddle Points: http://www.paddlepoints.net?PP=123 The height barrier is OK for most normal cars and canoes. Sounds like a sensible plan Maj, make sure you pack your drysuits... it's going to be wet and windy! It looks really bad... I think its only you, Brian and myself (and maybe Bonarmbj) who are confirmed as going... i am happy to postpone for another time if you prefer.. I'm not going to make it back from Yorkshire in time, so will have to give it a miss. Brian, I will try and arrange a paddle later in the month and pass on the paddle and the underblanket. Cheers mate no problem im sure we will catch up soon, checked out that new site and joined so might see you on that! I see they have a meet at the end of the month, will check my diary when I bet back to work on Monday to see if I'm free, and maybe see you there. Everything else though now in place, and plan to be set-up in the car-park by 1500hrs at the latest. Still juggling the hedgehogs, whilst spinning the plates of life! Well we made it onto the water and got thoroughly rained upon for the first two hours - well actually until we reached our lunch stop! Maj had brought his tarp along, which provided some welcome relief from the elements and protected us from the main downpour, plus gave some shelter for the fire. 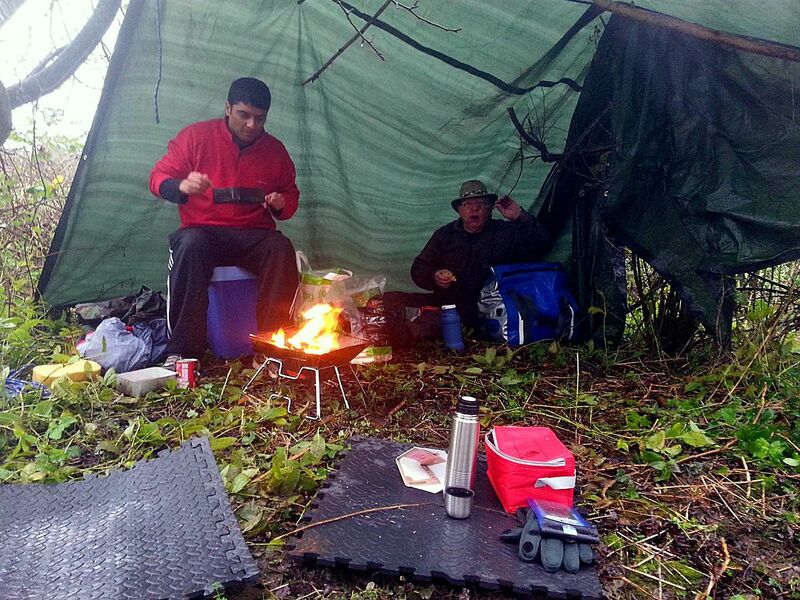 With lunch over, we enjoyed a dry and wind free paddle back to Winchfield to enjoy the hospitality tent (tarp) laid on by Bonarmbj - what a way to end a wet paddle! Many thanks to Majid and Brian for a great trip! Good to see you all and thanks to Mark for the tea and toast. Yep, good to see everyone and sample the Chef's work. 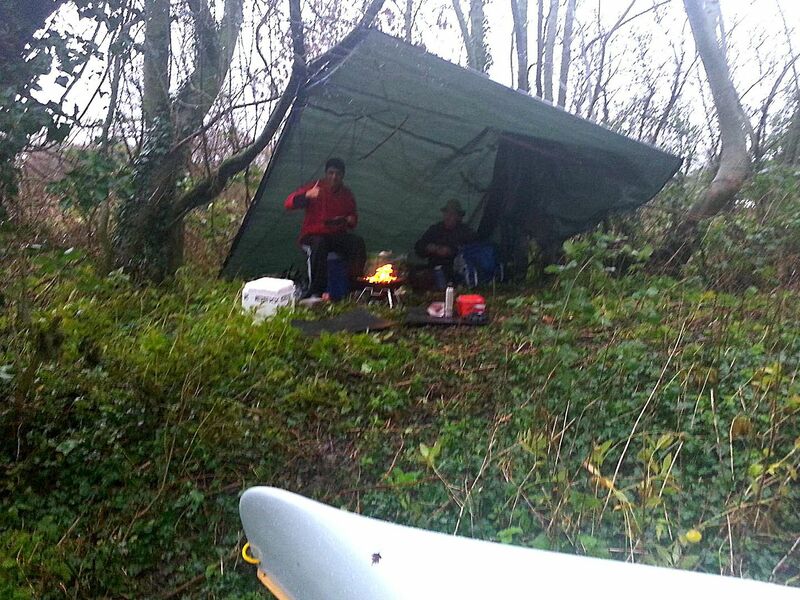 A canoe meet where 3 people paddled... but another turned up in a downpour to provide refreshments and another 3 who couldn't make the paddle, still turned up just to say hello and catch up with friends... a bit of that old SOTP magic methinks.